Sleeping is super important for us and for Will. Over the first three months we have found a few things that really help in this department... both for us and for Will. We have my old iPhone hooked up to an iHome speaker system in Will's room. Will is not calmed at all by lullabies but if you put something on with a good beat he calms down pretty fast. I've spent awhile putting together a pretty good Pandora list and we put that on for him during naps and at night. At about 1 month in I finally upgraded to Pandora One which was a great decision. Now there are no commercial interruptions. 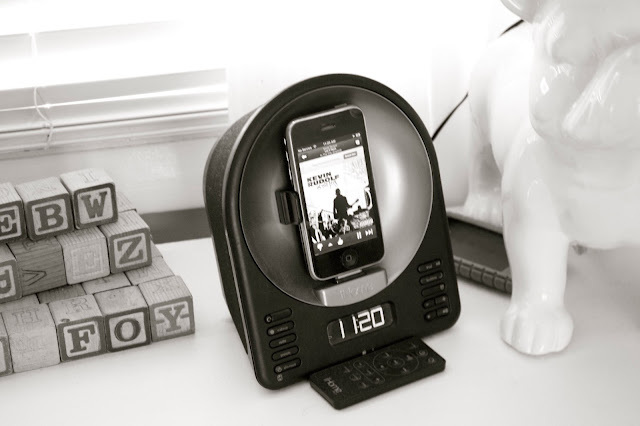 I personally love this little speaker system from iHome. It has great sound and is a nice compact size. It even will rotate the iPhone so you can watch movies on it. Will sleeps significantly better if he is cozy and warm. Even though we live in FL, the AC can chill Will off very quickly so we dress him up in warm clothes for sleep time. 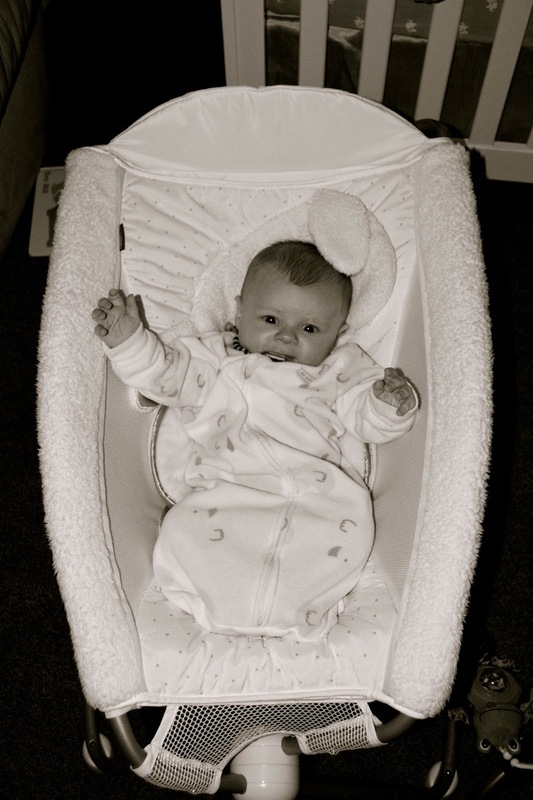 We love footie pj's and fleece sleep sacks and we use receiving blankets for an extra layer or Aden & Anais swaddle blankets if he needs a little extra soothing. I really like the footie pj's with zippers instead of doing up a ton of snaps and we both don't love the sleep sacks that are sleeveless. I really had no idea how much we would use receiving blankets. We went out and bought more since we use them for everything. The swaddle blankets are a little pricey but they are the only thing that Will can't get out of. He rarely is fussy enough to need a swaddle but when he does these definitely are the best and they are huge so they are also great for covering up his car seat when we're out and about. This has been Will's bed for the past three months. We love the portability of this rocker and the slight incline it provides. As the name suggests, it also rocks which is a feature we are constantly using. 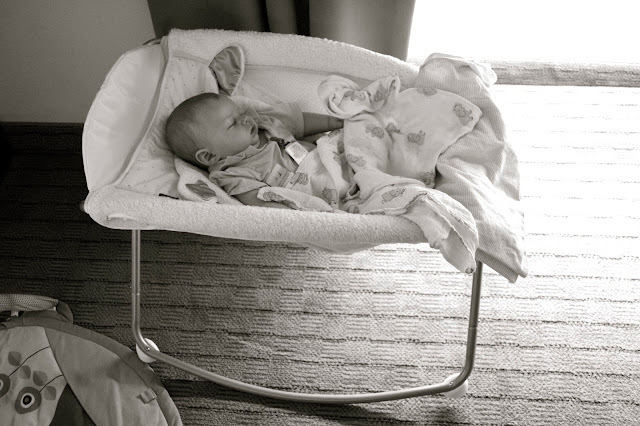 For awhile it was in our room but as Will got a bit older/noisier, he slept in this in his room off of ours. It's amazing how big he looks in it now compared to the day we brought him home. Pretty soon he'll be too big for the rocker and he'll move in to his crib full time and I'll definitely miss it. I was recently sharing Will's nursery with the Fibonacci numbers on the wall. anyway...I was wondering... have you liked having the laundry in his room? Does it make it easy to enjoy Will and watch him, while doing laundry. Is he bothered by the machines? Is it soothing for him? I would think it has it's perks...and then not some. I was hoping you'd share! I wish I'd had that when my kids were babies... well, there was a time when I'd have one baby in the playpen outside, while I had a toddler in the swing...and I'd be hanging out diapers! LOL... ah! those were the days. We've really loved having the laundry in his room. We're cloth diapering him and it really makes that whole process easy. He isn't bothered by the machines at all and we just make sure that the notification sounds are off.